"...a fine soprano with a suitably sweet and cheeky persona." Fast becoming acknowledged as being among the “future generation of superb sopranos,” Keri Fuge’s voice has been described as having “splendid clarity” and “silvery fire” that “sparkles in glittering numbers.” Her strong stage presence and ability to create “spellbinding pathos” has won her acclaim in the Baroque and mainstream concert and opera repertoire both internationally and in the UK. 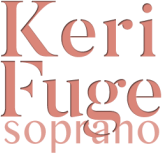 Current and future engagements for Keri Fuge include SOPHIE Werther and ZERLINA Don Giovanni for Stadttheater Klagenfurt, Pergolesi's Stabat Mater and Handel Cantatas with Academy of Ancient Music directed by Christian Curnyn at Milton Court Concert Hall London, Cambridge and Bath Bach Festival, Faure's Requiem at Royal Festival Hall with the London Philharmonic, Handel's Jeptha in Hannover Germany, FLAVIA Lucio Silla Göttingen International Handel Festspiele at Ludwigsburg Schlosstheater lead by Dorothee Oberlinger, Mozart Requiem with Stavanger Symphony Orchestra in Norway cond. Benjamin Bayl, ATALANTA Xerxes Early Opera Company, Cond. Christian Curnyn, AMOR Orfeo ed Euridice Vorarlberg Landestheater Bregenz, cond. Michael Hoffstetter, POPPEA Agrippina Brisbane Baroque in Australia, CUPID Rossi’s Orfeo Royal Opera House, Covent Garden at the Globe Theatre, AQUILIO Pergolesi’s Adriano in Siria Slowacki Theater, Kraków, concerts engagements at Birmingham Symphony Hall, Bridgewater Hall Manchester, Liverpool Philharmonic Hall, National Concert Hall Dublin, and Mozart’s Requiem at Royal Festival Hall in London. Details of further contracts for the 2018/19 season and beyond are currently being negotiated and will be announced in due course. Recent operatic engagements include ALINE The Sorcerer Buxton Opera House, DESPINA and DONA ISABEL Indian Queen covers English National Opera, BARBARINA Le Nozze di Figaro Glyndebourne Tour, GRETEL cover Hansel and Gretel Glyndebourne Tour and BARBARINA and CHOCHOLKA The Cunning Little Vixen covers Glyndebourne Festival, SUSANNA Le Nozze di Figaro cond. Diego Masson. ​​Recent concert engagements include Mendelssohn’s Incidental Music to A Midsummer Night’s Dream City of Birmingham Symphony Orchestra (recording with Chandos and Mo. Edward Gardner), St. Matthew Passion and Mahler Symphony No. 8 Bournemouth Symphony Orchestra, Mozart Requiem Royal Festival Hall, Bath Minerva Choir and Southern Sinfonia, QUEEN/FIRST LADY Handel’s Solomon London Mozart Players, Judas Maccabeus Llandeilo Festival of Music, SOLOIST Exsultate Jubilate and Let the Bright Seraphim Raymond Gubbay UK and European Tour (venues include Kultur und Kongresszentrum, Lucerne and National Concert Hall, Dublin), SOLOIST Rutter’s Mass of the Children The Royal Chelsea Hospital, Handel’s Messiah Polski Chór Kameralny in Gdansk, Jenkin’s The Armed Man/Elgar’s Spirit of England Lincoln Cathedral, Handel’s Armida Abbandonata London Handel Festival Orchestra, Schubert's Mass in B Flat, Beethoven's Mass in C, Handel's Messiah Black Dyke Mills Band, Handel’s Messiah for Woking Choral Society and Leeds Philharmonic Society, Opera Gala with the orchestra of Welsh National Opera. She also presented recitals at Wigmore Hall and The Forge in Camden with the Berlioz Society. Keri is an alumni of The National Opera Studio 2012-2013 sponsored by The Glyndebourne New Generation Programme. 2008-2010. Guildhall School of Music and Drama. Mmus in Vocal Studies and Performance with Marilyn Rees (All areas of study supported by The Tillett Trust, The Harold Hyam Wingate Foundation, The Mario Lanza Trust, The Stapley Trust. Keri is a recent Semi-Finalist in the Kathleen Ferrier Competition 2013, a Britten-Pears Young Artist Scholar 2011, winner of Michael Oliver Prize in The London Handel Competition 2011, winner of Dame Anne Evans’ Most Promising Singer in 2009 and winner of Hampshire Singer of the Year 2008. Keri continues to study with Marilyn Rees.